Krakow was also my first destination alone, thus beginning my solo adventure for the next three months. I also have to admit that I was looking forward to being alone after spending almost every waking moment (apart from the times I needed to shower or pee or brush my teeth, I don’t poop, I’m a lady) with someone else for almost two weeks. I took the night train from Prague to Krakow, which was an interesting experience in itself. I booked myself into a 3 berth carriage and was accompanied by two other women (I thanked God for not being dumped with a couple, they’re the worst). I quickly befriended another girl who turned out to be a free walking tour guide in Krakow. I proceeded to tell her how much I just love free walking tours and we ended up chatting for a bit. Three beds with no space to sit up. I was on the top bunk and even hit my head a few times in the night. It’s so hard to be tall. The same storage space but from a different angle. I’m trying to give you the full picture here! The sink. What else am I supposed to say? The wind was crisp and I enjoyed the walk to the hostel. It was nice to stretch my legs and explore a new town, even with a ginormous backpack. I loved watching sleepy Krakow wake up. After arriving at the hostel, I grabbed some free breakfast (score!) and caffeinated myself with fresh coffee from real coffee grounds, not that Nescafe 3-in-1 crap I’ve been having for the past few days (double score!). Guess what I did next? That’s right, I joined the free walking tour around the old town at 10am. I met more people in that one tour than I had in the past few weeks. One girl from Malaysia who was touring Europe for a month, another from Columbia who was in Poland for business and a very cute guy who was travelling before starting his Phd in Applied Maths (he said something about physics somewhere, who knows, I was distracted by his face). For those hoping to visit Krakow, I highly recommend this walking tour not only because the guides are incredibly experienced and have a good sense of humour, but also because they give out kickass maps at the end of tour. It had a ton of recommendations for good places to eat, cheap places to eat, museums, ideas for gifts and Polish pickup lines. That night, Joanna and I met up for dinner. We went for sushi in Genji which has a beautiful interior and very friendly staff. I have never wished to have been able to speak Polish anymore than my short stay in Poland. Everyone I met was friendly and nothing short of proud of their country. Even the guy who drove me to the airport at an exorbitant rate was friendly and loved showing off his hometown to me. 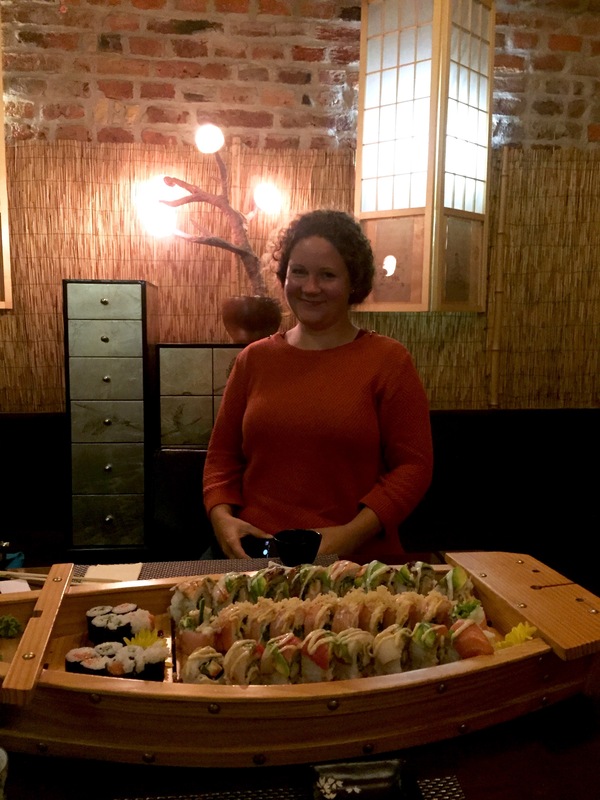 Proof that I was with another human being and a sushi boat. Too much sushi + great company = great diner with Joanna. We talked about our ambitions and what we wanted to do when we grow up. We chatted about family and friends. We chatted about the refugee crisis in Europe. We chatted about our countries. It was great and I added her on Facebook. That’s how close we are. BFFs. Best Facebook Friends. My trip to Auschwitz and Birkineau, the largest cemeteries in the world.